God, No! has a range of stories--funny, tender, sad, and nearly all autobiographical--from a writer, who has been inside the showbiz whale for more than thirty years, travelled the globe performing magic, and lived for a decade in the dark heart of American greed, commercialism and filth: Las Vegas. Some of the essays illuminating Penn's First Commandment (The highest ideal is human intelligence, creativity, and love. Respect those above all.) include Siegfried, Roy, Montecore, Penn, and Leather Pants, and You Can Be Bruce Springsteen Too! As he says of Commandment #4 (Put aside some time to rest and think): "If you're religious, that might be the Sabbath; if you're a Vegas magician, that'll be the day with the lowest grosses." Commandment #5 (Be there for your family. Love your parents, your partner, and your children), includes an astoundingly funny and heartfelt essay about Penn's mother, a late-in-life Atheist herself, and Shirley, the local lesbian pastor. And of #8 (Don't steal): "This includes magic tricks and jokes--you know who you are!" Penn's hard-earned and worldly experience combined with self-taught wisdom and plain common sense make this absurdly funny collection a heartfelt and hysterical read. Thanks to our friends at Simon & Schuster, we've got three copies of Penn Jillette's God, No: Signs You May Already be an Atheist and Other Magical Tales on DVD to give away! For your chance of winning, send your name and full postal address to emotionally14@hotmail.co.uk before midday on Tuesday 15th November, making sure to put "God, No!" as the subject. The first three entries out of the electronic hat after the competition closes will receive a copy of this awesome book! Don't forget to put "God, No!" in the subject line. Incorrectly labelled or blank entries will be discarded. God, No! 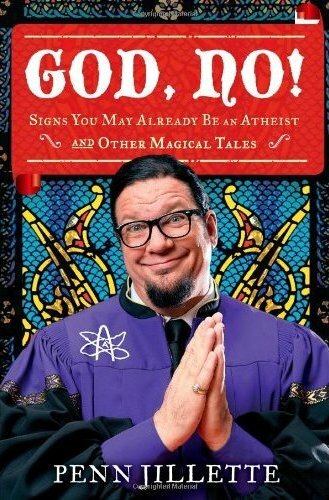 : Signs You May Already be an Atheist and Other Magical Tales is available from Thursday 10th November, courtesy of Simon & Schuster.